A reflection by Niaz Dorry, NFFC’s new Executive Director, on the process of stepping into a new role. At the NFFC winter board meeting in late February, after a long day of productive talking and planning, Farm Aid Executive Director Carolyn Mugar came up to me and said, “I have an idea and you’re not going to like it.” Hmmm… that’s an ominous way to start a conversation, I thought, but hey, it’s Carolyn. Maybe she’s going to tell me we can get a fisherman on the Farm Aid stage this year! Or the SeaFire Kids are part of this year’s line up? Or I get to smoke a joint with Willie Nelson on his bus? But no… instead, she asked if NAMA had ever thought of sharing leadership and resources with NFFC. Again… hmmm… what? Although I wasn’t surprised by what Carolyn was asking, I wasn’t expecting it. My first thought was that I don’t want the family farmers to think we – those of us doing fisheries work – are trying to derail or usurp their power and agenda. I’ve seen that happen too often to want to be “that person.” And then there was another issue: the expectation of having to wear Kathy Ozer’s hat. Will I ever measure up in the eyes of those who knew her and worked so closely with her for decades? On the fishing front, Carolyn reminded me of how engaged everyone was during session at the meeting that morning when Amy MacKown of the NAMA team discussed the Fish Bill. The similarities with family farmers’ struggles — just on the policy level — were enough for everyone to be nodding their heads in unison. Carolyn was right. And, honestly, I already knew that, deep down inside. Still. I had to think about this. On the Kathy front, I needed divine intervention. As if my mind wasn’t already blown by the conversation with Carolyn… I hadn’t told anyone about that — how did he know?? I turned to David with disbelief. I took the hat, and in a clownish fashion, wore it for a little while — crying most of the time. I tried to explain the gift from David to those in the room without giving away what was really going through my mind. I didn’t tell anyone of the conversation with Carolyn. I just wore the hat. Which didn’t fit, by the way. I had to tweak it quite a bit just to get it to sit on my head properly. The tweaking of that hat became a metaphor for what happened over the course of the next few weeks. I went into an extreme soul searching mode, and I thank many of my dear friends – especially Paul Bogart, Harriet Barlow, and Tom Kelly – for their ears and sage advice. They helped me get through my insecurities, tackle the “what if”s, apply a creative lens to the situation, declare radical acceptance, and finally step onto the road. What I learned along the way is that Kathy’s hat won’t fit me. Not as she wore it. Not to (non-violently) beat the metaphor to death, but the truth is that our heads are shaped differently. 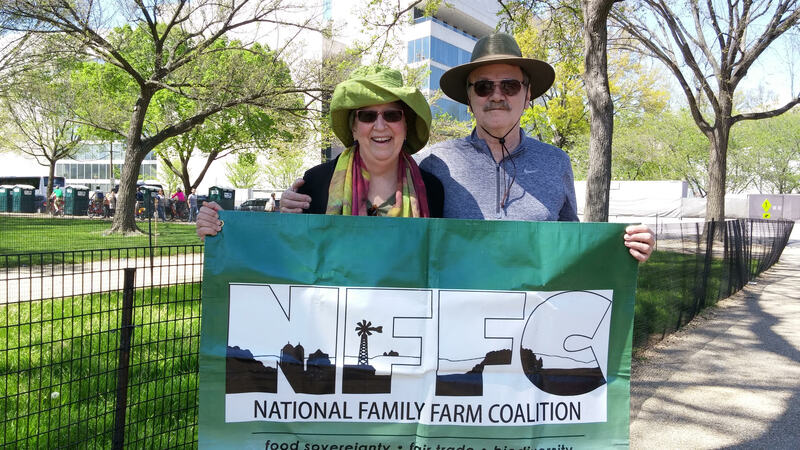 Kathy’s head left an indelible impression on the movement for a more just food system that honors family farmers. None other can erase or replace that impression. The boards of both organizations expressed willingness to go where most won’t. As Pat Sweeney of Western Organization of Resource Councils said recently: we are making the road by walking. The boards decided to walk. The day after both boards’ votes on the shared leadership proposal were cast, David called me. I thought maybe he had heard something through the grapevine? He said he was calling to see how things were going. How was NFFC doing? Have we found a new ED yet? I kept asking him if he had talked to anyone, and he said no… that’s why he was calling. He hadn’t heard anything. Kathy Ozer, wearing the hat in question, with husband David Battey. So I told him the whole story, and the role he played in my taking the conversation with Carolyn seriously by giving me Kathy’s hat the next day. And now here he is calling the next day after the decision is made. He is clearly tuned into the right signals! His response to the news was that Kathy would be really happy about it and that he is fully supportive. We got our divine intervention. Anchors away and onward we go, and we know that Kathy has our back. This entry was posted in Blog and tagged Kathy Ozer, leadership, Niaz Dorry, Reflections. Bookmark the permalink.